Major Japanese producers have announced factory shutdowns and shop closings in China in the days before a possible fresh round of anti-Japanese protests over a territorial dispute. ­Japanese car maker Nissan Motor Co said it suspends China production for two days on Monday, while Honda said it will suspend production starting on Tuesday for two days after attacks on its showrooms over the weekend. The Uniqlo apparel retailer closed outlets in China and said it may close more. Mazda Motor Corp will halt production at its Nanjing factory, which it jointly operates with Chongqing Changan Automobile Co and Ford Motor Co, for four days. Meanwhile electronics major Panasonic said one of its plants had been sabotaged by Chinese workers and would remain closed through Tuesday. Canon Inc plans to shut down three of its four Chinese factories on Tuesday. The new protests over the reported purchase of three disputed islands by Japan are expected on Tuesday – the anniversary of Japan’s occupation of parts of mainland China in 1931. 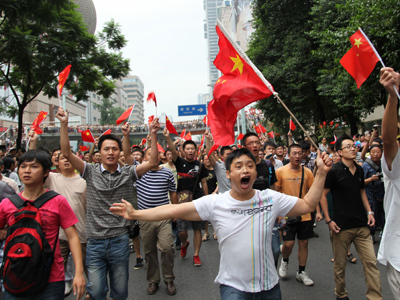 The Japanese authorities have warned against unnecessary travel to China and called expatriates to stay indoors ahead of probable anti-Japanese protests. Meanwhile All Nippon Airways reported a boost in cancellations on Japan-bound flights from China. Many Japanese schools across China, including in Beijing and Shanghai, have cancelled classes this week. China and Japan have been arguing over a group of uninhabited islets in the East China Sea. Last week the Japanese government said it had bought three of the islands owned by the Kurihara family. 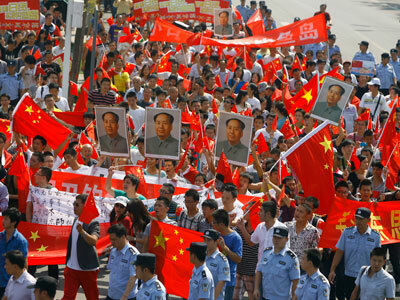 The move infuriated Beijing and triggered large-scale protests across China. The Chinese government has warned that the territorial dispute between Japan and China threatens trade relations but has pledged to protect Japanese firms and citizens. "The gravely destructive consequences of Japan's illegal purchase of the Diaoyu Islands are steadily emerging, and the responsibility for this should be borne by Japan," Foreign Ministry spokesman Hong Lei said at a news briefing. China and Japan – Asia’s biggest economies – generated trade worth $345 billion last year. The anti-Japanese protests over the weekend also hit the shares of Hong Kong-listed Japanese companies on Monday. 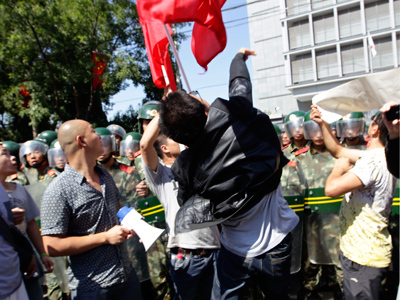 Meanwhile Chinese activists are calling for a boycott of Japanese goods at a protest outside the country’s embassy in Beijing.